Keri Russell Does The School Run With Willa & River! 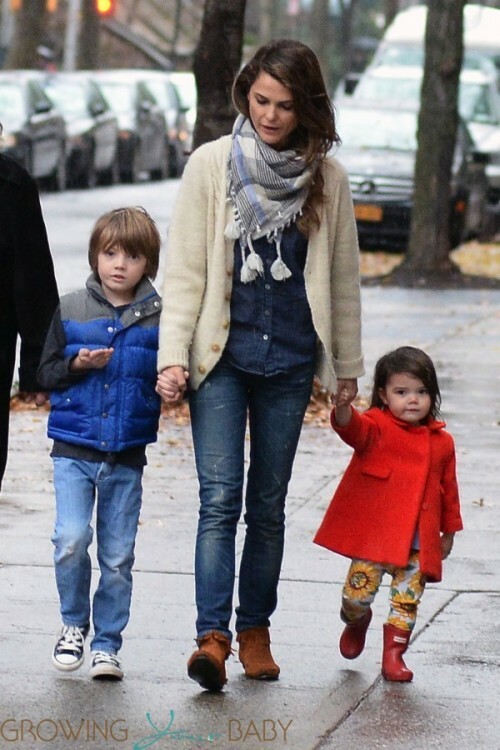 Home » Keri Russell Does The School Run With Willa & River! Keri Russell braved the rain while doing the school run with her kids this morning! While dressed in a button up shirt, jeans, a warm sweater and moccasin boots, the actress walked hand and hand with her son River and daughter Willa through Brooklyn. It has been a very long since we have seen River and the first time we have met Willa. Both kids were in good spirits, despite the crummy weather. The sighting comes just a day after it was reported that Keri and her husband of 7 years, Shane Dreary had quietly split. If that wasn’t enough for her to worry about, the NYPD confirmed that Keri’s Brooklyn home was burglarized on Wednesday while the actress was sleeping. The police told the AP that Keri called 911 after she was awakened at around 3 a.m. on Wednesday by sounds on an upper floor of her Brooklyn Heights home. Two men entered the apartment through a window and stole electronic equipment and jewelry before fleeing. Thankfully they were arrested a short time later and all the stolen property was recovered. Hopefully the craziness is behind her and she can move on to having a great holiday season with her family! Sacramento Couple Welcomes Identical Triplets!